Meet George the Elephant, my newest creation. Sometimes it's just fun to sew a little project, just because. I used some of the new Denyse Schmidt fabric to make this little guy. The pattern is from Heather Bailey. Also, I was awarded the Stylish Blogger award from Flo over at Butterfly Quilting. Thanks so much!! She has been following my blog for a while, and I really appreciate the nomination. Thank and link back to the person who gave the award. Then award some of my favorite bloggers, having given them some notice to see if they are willing to accept. And finally share 7 things about myself. Edeenut Creates: She is an old college roommate and so talented. She is always makes great projects that look so professional. Fake It While You Make It: Carolyn has been sewing dresses recently that make me what to actually try sewing one myself...maybe. Leedle Deedle Quilts: Leigh just started up her quilting blog. She is a fabulous quilter and has been at it for years. The Sometimes Quilter: Winnie also just started up her quilting blog. She has a huge love of Heather Ross, and it shows. She has a new little baby to help model her quilts and does some fabulous work. I am addicted to the mini Cadbury eggs. This is a really bad time of year for me and my waist. My favorite shoes are my Croc flip-flops. Not exactly stylish, but so comfortable. I attended the University of Utah for graduate school. The university had a full month off in February for the 2002 Winter Olympics, so the hubs and I decided it would be a great time to get married. Unfortunately, we didn't attend any of the Olympic events. I hate wearing socks. I will wear sandals as long as it's not snowing and/or at least 40 degrees. I have a beautiful FQ stack of Bliss fabric that I won in a giveaway months ago from Adrianne over at Little Bluebell. I'm still afraid to cut into it. It's just too pretty. I've moved it so I see it all the time hoping for inspiration and motivation to actually cut it up. I love the color orange (though this has only been the case for about year). I know I've mentioned this before, but I also love Diet Coke. Fab 7 - I'm with you on the mini eggs and crocs! LOL! I haven't cut into my stack of Bliss yet either. I keep changing my mind what kind of quilt I want to make. I told you already on flickr, but I think George is so so cute!! I'm totally in love with George. Elephants are my favorite animals! Hummingbirds are a close second. LOVE him! And I love that elephant. How adorable! Oh MY GOSH, Kati! I LOVE that elephant!! I have a baby shower to go to May 14th and I'd love to include one of these with the quilt I'm making. Is there any chance I could pay you to make one for me?? Shoot me an email and I'll reply and give you more details. I'd buy the pattern, but I know me, I don't know how to sew anything except for quilts! So it'd never get made! 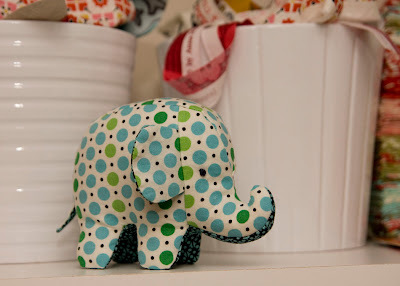 Love the elephant; I've liked that pattern for a long time. I absolutely love the elephant...my favorite animal! I was looking for a pattern awhile back, I will have to check this one out, it is soooo cute. I, too, am a Diet Coke drinker and am totally in love with Cadbury eggs. Especially the minis but I am not picky! That elephant is just so adorable! I can absolutely relate to not being able to cut into a prized collection - I've got a few that I can't seem to cut into because I can't stick to an idea for too long! And I think Diet Coke is the drink of choice for quilters, it seems - there's so many of us that list that as a fave (it's my fave too). Too funny! Adorable! Is he too cute to stick a pin in? You and Jason and those Cadbury eggs! I don't get it! Squeal!!!!!!!!! That elephant is the cutest thing EVER!! !